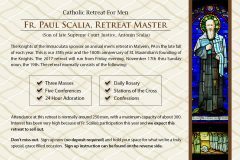 The 35th Annual Knights of the Immaculata Retreat for Men with Fr. A traditional retreat for men. All men are welcome. This retreat includes Mass, conferences (talks), Stations of the Cross, private adoration and much more! It coincide with the 100th anniversary of its founding by St.
Maximilian Kolbe and 35 years at Malvern. This year’s retreat master is Fr. Paul Scalia of the Arlington Diocese and son of the late Supreme Court Justice Antonin Scalia. Fr. Scalia is the author of That Nothing May Be Lost.